If you live in an older home, consider any one of these energy-saving upgrades to reduce heating costs and still stay warm this winter. Older homes certainly have their charm, but they’re not usually the most energy efficient or the easiest to keep warm. About one-third of our nation’s energy consumption comes from the residential sector, and about 70 percent of this can be attributed to homes built before 1983, according to a study by ConSol, a building and energy consulting firm in California. But living in an older home doesn’t mean you have to put up with drafty doors and cold nights huddled around the fire. There are several smart ways to work with your home’s existing structure to improve its efficiency and make it as warm and comfortable as an old sweater. You’ve no doubt heard that knowledge is power. Well, in this case, knowledge can actually save you power. An energy audit is a great place to start when you’re seeking to retrofit an older home to make it warmer, because it will show you exactly where most of your warm air is escaping and cold air is entering. Some utility companies offer energy audits for free, so check with your providers first to see if this is a possibility. 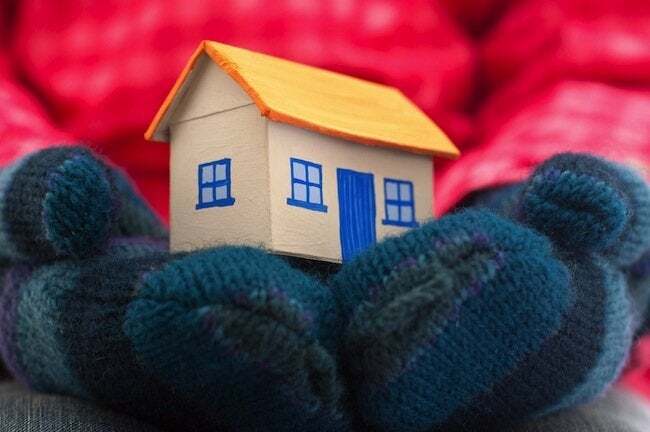 If not, you may wish to hire a professional energy auditor who will go beyond pointing out the obvious sources of heat loss and give you a comprehensive plan for warming up your home. If you find a professional too costly, you can do a basic energy audit yourself by finding leaks with the smoke from a stick of incense. On a windy day, simply wave the smoke from the incense near windows, doors, and anywhere else there might be a gap to the outdoors. The smoke will blow inwards where you have gaps that let outside air in, and it will get sucked toward heat-depleting leaks. In both cases, you’ll want to close up the gaps with caulk or insulation. Did you know that a one-eighth-inch gap beneath a 36-inch door has the same effect on your home as a 2.4-inch-wide hole in the wall? Sealing gaps around doors and windows is one of the easiest, cheapest, and most effective ways to warm up your older home. Place weatherstripping around loose doors and windows, and caulk obvious holes around window sashes. You can also seal windows for the winter using a plastic sheeting kit you can buy at your local home center or hardware store. Even drapes and blinds can help retain heat in the colder months. If you still notice a draft beneath your door after you’ve installed weatherstripping, a rolled up towel or “door snake” can further block drafts. Older homes tend to be insulation challenged. They did not always receive the benefit of this energy-regulating material or the vapor barriers that often accompany its installation. If your home is insulation free—or just lacks adequate insulation—you can retrofit it by hiring trained installers to inject a nonflammable foam resin into existing walls. This means there’s no need to remove either exterior or interior walls and, according to the manufacturers, the installation can take less than a day for a whole house. The foam is filled with tiny air bubbles that increase its heating and cooling properties. Before insulating an older home, however, be aware of the fact that you need to maintain some airflow. Old homes were designed to “breathe,” and if you seal them up too tightly, you might experience issues with moisture buildup. Talk with your energy auditor to make sure that you’ll continue to have adequate airflow once your home has been retrofitted with insulation. A thermostat that acts like the brain of your heating system might seem like something compatible with only newer high-tech homes, but replacing an old thermostat with a newer model is a relatively straightforward affair that can be done by most DIYers in homes of any age. You can buy a programmable thermostat that can create different heating schedules for every day of the week, or one that has a set schedule for weekdays and another for weekends. By operating your home’s heating system through a “smart” thermostat, you can make sure the house stays warm and toasty when it’s occupied and saves you money on heating fuel when it’s not. For maximum efficiency, thermostats of all kinds should be installed away from heating and cooling vents, open windows, and direct sun, and should be set to remain at steady temperatures for long periods of time rather than spike up and down throughout the day. Unlike electric baseboard units or forced hot air systems that constantly spike the temperature and then kick on again when the house cools down, radiant floor heating provides a quiet, constant warm glow throughout your house. You can retrofit radiant floor heating beneath the floors, in effect warming the actual structure of your home. Not only is this a very energy-efficient way to heat your home, it’s also very pleasant. Imagine never again having to step on a frigid floor on a cold winter’s morning. Most radiant floor systems these days are being installed into new homes and would be difficult to retrofit into an older home. That’s not the case, however, with a newer product called Warmboard. 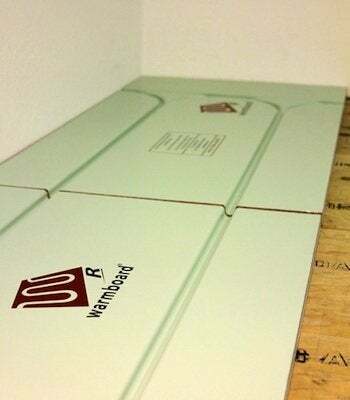 Warmboard-R is a subfloor panel designed specifically for remodels. These radiant panels transfer heat quickly from the water in the system’s tubing to the inside of your home. The radiant panels actually increase the rigidity of existing subfloor panels in old homes as well as provide a flatter and smoother subfloor surface for finished flooring. The thick aluminum coating on the Warmboard-R panels can also save you money, because the panels transfer more heat to your home far more quickly than other radiant options while requiring less hot water to reach the desired temperatures in your home.